Firexpress has developed two fire fighting all-terrain vehicles. The fire fighting all-terrain vehicles (ATV) are intended for fast response fire fighting when rough terrain has to be navigated. This can be in a mountainous or forested area. The ATV can also be used in towns with congested traffic or narrow roads, where other four-wheel vehicles cannot get through. They are often used on small islands that does not have an ordinary fire brigade. A government official like a police officer or forest officer will be trained to operate the ATV and fire fighting equipment. A Polaris Sportsman X2 570 suitable for one person has been fitted with the components of a pump driven unit on the front rack and a 140 litre water tank on rear of the ATV. A rollover bar and emergency lights have been mounted for safety. A Polaris Ranger XP 900 suitable for three persons has been fitted a 300 litre water tank with a pump driven unit mounted in its bed. Emergency lights have been mounted for safety. The units have a self-priming membrane pump that pressurizes the water up to a working pressure of up to 40 bar. The pump is driven by a petrol engine and delivers a flow of 30 litres of micro-drops per minute or 150 litres of aspirated foam per minute at a range of 15 metres for micro-drops and 18 metres for a jet of foam. The system has an integrated foam delivery system, that mixes the foam into the water just before the pump. The foam percentage can be adjusted by the user by inserting an orifice giving the desired foam percentage between 1 and 6%. The water tank is made of powder coated aluminium, and has internal baffle plated to increase stability during transport. A suction system for suction of water from external water sources such as rivers, lakes, the sea, swimming pools or other water sources has be installed. The system can be used simultaneous with using the fire fighting system or to fill the water tank. The suction rate is 38 litres per minute. The pump driven unit on the Polaris Ranger XP 900 can have a secondary foam delivery system installed to either increase the quantity of fire fighting foam or for carrying a secondary foam type. Via a selector switch, it is possible to choose using foam from either foam container or no foam at all. The Polaris Ranger XP 900 can be fitted with a tool box and a road registration package that adds convenience and safety to the driver and enable registration with the proper authorities for road use. Various quick fire hose connectors like Storz, BS 336 and other can be mounted on the water tank for fast filling. 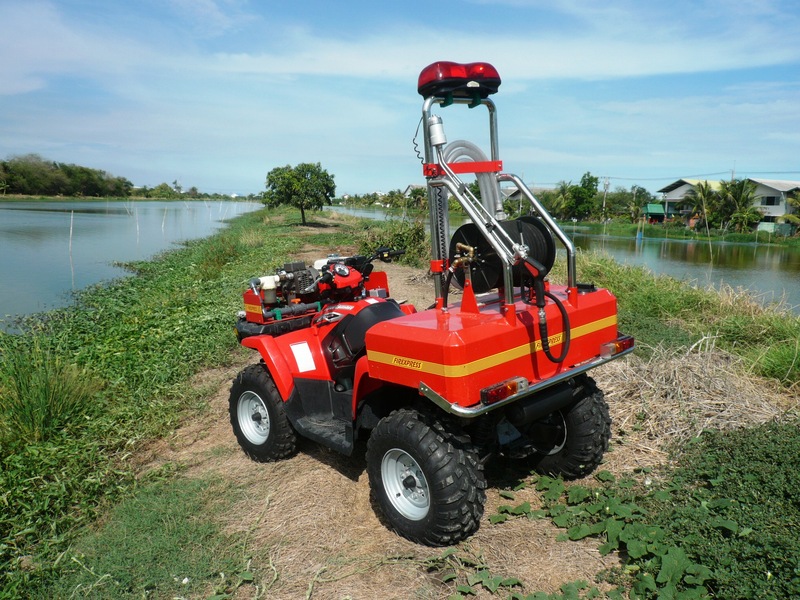 The fire fighting all-terrain vehicle built on a Polaris Sportsman X2 570 used in rugged terrain in Samut Prakarn, Thailand. The fire fighting all-terrain vehicle built on a Polaris Ranger XP 900 in a forest in Denmark.